This is from two weeks ago, when we had about 2,000 people. We had about the same size crowd last Monday when there was a tornado watch. We are dedicated to making change. I think it’s important to talk about Moral Mondays here, to explain why I got involved, why I got arrested on May 13, and why I continue to go for the rallies. First of all, let me say in response to those who say we can’t accomplish anything with these demonstrations, I wouldn’t have gone if I didn’t think we could make a difference, and I am willing to tolerate the vitriol of people who would discourage us because I think they are afraid of us and what we stand for. Those lives matter to me. Each one of them matters. I don’t care if it is a homeless person who is addicted to drugs and alcohol. I believe each life has worth. If you don’t believe the same, please don’t call yourself pro-life in front of me. My primary passion is health care, but when we take away unemployment compensation from more than 70,000 people, it has consequences. Most of them also lack access to health care because you can’t pay for COBRA if you don’t have any income, and most adults aren’t eligible for Medicaid here in NC. When we de-fund schools, we rob children of the chance to rise out of poverty and provide for themselves and their families. They also will be the ones most likely to not have access to health care later on. These issues are deeply connected to each other. Living wage impacts poverty, and all the stresses that come with it. People who have enough to live on are healthier overall because they don’t have the stresses associated with poverty. I have visited my legislators repeatedly to educate them on the importance of access to health care and about the lower costs associated with access to care. My representative voted against Medicaid expansion. He voted to cut unemployment benefits. He supports a voter ID law that is a thinly disguised poll tax. I am frustrated beyond words. I cannot fathom the reasoning behind barring access to health care for 500,000 people. Our state’s computer system is their first excuse. It isn’t up to the task, they say. But then they decline to mention that we turned down federal money to upgrade the system. When I reminded them of that, they said we have to fix Medicaid first. Well, North Carolina’s Medicaid system was a national model until its funding was slashed two years ago. Restore the funding and the system will be a model again. Instead, though, they are going to try and privatize it the way they did with the mental health system a decade ago. That “reform,” you may recall, was an unmitigated disaster. When I explain that, they usually have a meeting they have to rush off to. They aren’t listening, and it frustrates those of us who oppose what they’re doing. My heart breaks for people who will die because of these misguided decisions; it breaks for the families of those casualties. Unless you have held the hand of a loved one as he or she dies unnecessarily, you can’t know the pain. As a person of faith, I take seriously the Bible’s instruction to care for “the least of these.” And it is not just Christianity that requires this of people; it is a basic tenet of every major religion, and it is important to just about every atheist I know. That’s why nearly 400 people have gone into the Legislature Building and been arrested. Dozens of them are clergy. Some are teachers and professors, students, old, young, black, white, Asian, hippies and lawyers. 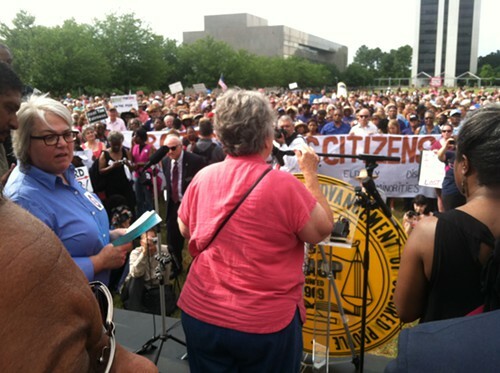 This is a diverse crowd, and its members are passionate about justice for all North Carolinians, not just the wealthiest. As the ones being arrested go into the building, they are cheered by a crowd of thousands. Hundreds of people move to the side of the building to await the departure of prison buses filled with people who are not afraid to speak truth to power. When I was arrested, those cheering voices assured me I was doing the right thing. They gave me courage and hope. I do not go to Moral Mondays for political reasons; I go for moral reasons. I go because if I do nothing, I am as much to blame as those taking the immoral actions. I go because every life has worth.